Agilent Technologies Inc. (NYSE: A) has announced the extension of its source-corrected noise-figure measurement capability in PNA-X network analyzers to 43.5 and 50 GHz, while continuing to maintain the highest noise-figure measurement accuracy in the industry. Built directly into the Agilent PNA-X, the technique provides a complete single-connection, multiple-measurement capability for R&D and manufacturing engineers developing and testing low-noise transistors, amplifiers, frequency converters and transmit/receive modules. Accurate noise-figure measurements are required to test devices in aerospace/defense and wireless communications systems, but can be difficult to achieve when a traditional noise source cannot directly connect to the device under test. This scenario creates a number of problems in today's automated test, on-wafer, or in-fixture test systems. Agilent's source-corrected measurement technique eliminates these problems and provides a unique single-connection solution for S-parameter and noise-figure measurements, along with other measurements such as harmonics, compression, and intermodulation distortion. The use of a single connection for all measurements speeds up testing, improves throughput in manufacturing, reduces wear on connectors and probes, and minimizes risk of wafer damage. Agilent's new 50-GHz noise hardware features a built-in low-noise receiver and impedance tuner that simplify measurement setups and enable fully vector-noise-corrected measurements. Unlike other noise-figure solutions, Agilent's PNA-X network analyzers combine S-parameter vector-error correction and an impedance tuner to fully remove the effects of imperfect system source match. Agilent's solution also corrects for the interaction between the output match of the device under test and the noise figure of the internal receiver. These advanced error-correction methods result in accuracy that is superior to the Y-factor method and other simpler forms of the cold-source method. In addition, users can now conveniently choose to use either a power meter or a noise source to calibrate the noise receiver. The 50-GHz noise hardware is also available in 67-GHz PNA-X models. 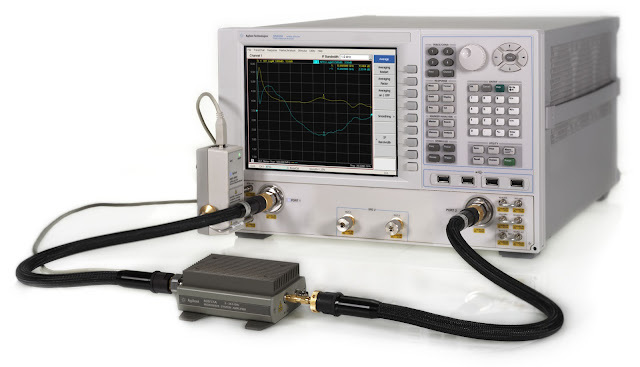 To measure noise figure between 50 and 67 GHz, engineers can use the standard network analyzer receivers and an external ECal in conjunction with an external LNA and high-pass or band-pass filter. "Agilent's high-performance, network-analyzer-based noise figure measurement technique is the most accurate available today," said Gregg Peters, vice president of Agilent's Component Test Division. "Extending its reach to 43.5 and 50 GHz opens the technique up to new applications, while further reinforcing our commitment to providing the widest range of noise-figure-measurement choices to meet our customers' ever-changing requirements." The Agilent PNA-X is part of the PNA family of network analyzers, which includes the PNA-L, PNA and PNA-X Series, covering frequencies from 300 kHz to 1.05 THz. The PNA-X provides complete linear and nonlinear component characterization in a single instrument with a single connection. The entire PNA family offers advanced connectivity via LAN, USB and GPIB; an easy-to-use open architecture based on the Microsoft Windows(r) operating system; and an extensive embedded help system. The PNA family's CPU and operating system can be upgraded as technologies evolve. For information on the source-corrected noise-figure option or the PNA-X network analyzer, go to www.agilent.com/find/pna-x. Photos of the measurement technique are available at www.agilent.com/find/PNA-X-NF_images.